Congratulations on your purchase of the SpygearGadgets Professional Grade USB Flash Drive Voice and Audio Recorder with 25 Day Battery Life. This miniature voice recorder is easy to use, and requires very little setup. To get started with the voice recorder, open the product box, and you'll find two things inside: the voice recorder itself, and a 1-page quick start guide. It will take up to approximately 2-3 hours for the recorder to fully charge. 2. The second way to check the battery level is when you first turn the recorder on (into one of the 2 recording modes). When you turn the recorder on, for 5 seconds the LED light will indicate the battery status level just like as mentioned above. So for example, if you turn the recorder on, and the little red LED blinks red for 5 seconds, it means the battery level is between 30% and 70% remaining. 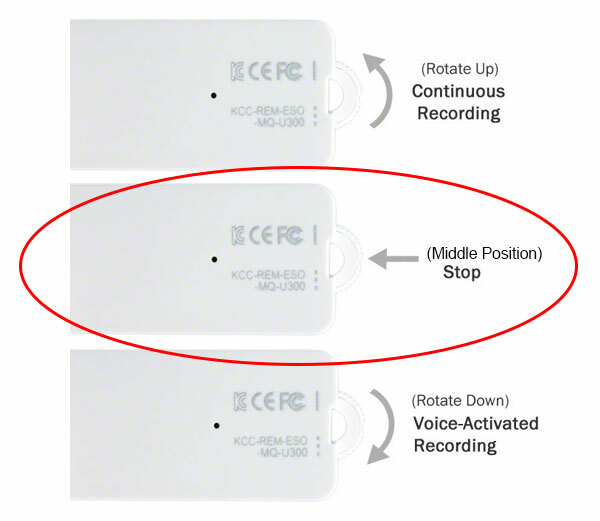 In continuous recording mode, the voice recorder records continuously until either the dial is turned back into the "Stop/Middle" position, or until the battery runs out. One of the best features of this device that makes it unique from other voice recorders is it's ability to record only when audio/voices are detected. This allows the device to sit in "standy mode" for up to 25 days on a single battery charge, and get up to 15 hours of recording. So how does voice activation mode work? Whenever the device is turned on and in voice activation mode, it will be listening for sounds or voices. Once it detects audio, it will begin recording. Once it doesn't hear any more audio, it will return to standby mode. When you're ready to listen to your recorded audio files, listening to them is easy. 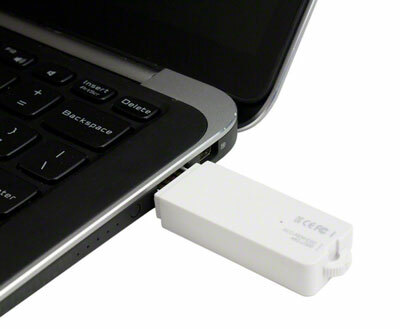 Simply plug the flash drive voice recorder into your computer's USB port. Because USB is a universal technology, there is no special software or drivers needed, and the files can be played back on both PC and Mac computers. After you've listened to your files, you can copy/move/delete them just like a regular file. You can move or save them to your computer's hard drive, or even email them to a friend or colleague. If you have any additional questions or need assistance using the flash drive voice recorder, our product experts are available to answer any questions you have, just contact us and we'll be glad to help.